The Cobblers could have the chance to go top of the Sky Bet League Two table this Saturday, and manager Chris Wilder wants his players to grab it with both hands. Town, who are second in the table level on points with leaders Plymouth Argyle, take on play-off hopefuls Morecambe at Sixfields looking for the three points that could take them top if results elsewhere go their way, with the rest of the top five playing each other. Argyle have a very tough game as they travel to fourth-placed Bristol Rovers, while third-placed Oxford United have a task on their hands as they travel to fifth-placed Portsmouth. It is a big weekend in the promotion race and Wilder is urging his players to make the most of what is a great chance to further enhance their already excellent position. “We know that if we win we have a good chance of going top, and that’s what we need to do,” said the Cobblers boss. “We are not looking ahead of ourselves, we are not looking at the games in February or March, there is no eye off the ball in terms of that. “We are fully focused on Morecambe, and we want to finish this little period with a win and add another three points to our tally. Then we have the break of two weeks and we want to finish on a high. “We will have to play well on Saturday, we will gave to go again and we have to lift ourselves, but I would expect the crowd to be very healthy again and we have an opportunity of getting three points. “There are a lot of big games on Saturday, Bristol Rovers play Plymouth, Oxford are at Portsmouth, so not all of those four teams can win. Wilder has been delighted with the performances of his team so far this season, and says the key to their success has been the fact the team is playing pressure-free football despite their lofty position. “We are not feeling anything at all, we are just looking for the next challenge,” said the Town manager. “I’ve not seen any sort of pressure football from the team, or that we have played any nervous football at all, right the way through the season. 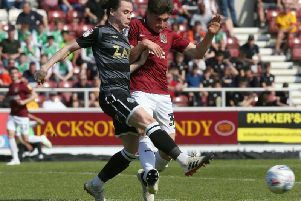 The Cobblers were briefly top on goals scored last week when they led 2-0 at Plymouth, but the Pilgrims’ late consolation ensured they held on to top spot on goal difference, and Wilder says that annoyed his players. “A few of them were disappointed with Plymouth scoring that late goal,” revealed the Cobblers boss.